Functionally graded materials (FGMs) are established as an attractive class of materials in which it is possible to create a gradient of properties that cannot be attained in any spatially-homogeneous materials. FGMs have properties which vary as a function of position; continuous changes in the characteristics such as: chemical composition, grain size, porosity, etc., result in the gradient of electrical and/or magnetic features, and also, in enhanced structural performances, such as mechanical and thermal expansion. FGMs have been used for the fabrication of various technological components, such as electrical devices (piezoelectric ceramics, thermoelectric semiconductors, etc. ), electrochemical ones (for example solid oxide fuel cells - SOFC, or high-efficiency hybrid direct energy conversion systems - HYDECS), as well as biomaterials. Quantitative predictions of the sintering process of most systems of industrial importance and, furthermore, designing strategies to control sintering in order to prepare high-quality products, can be achieved through the concept of the master sintering curve (MSC). where: t is instantaneous time, which is a function of temperature, c is the heating rate, Ea is the activation energy, R is the gas constant and T is the absolute temperature, and To is the temperature below which no sintering takes place. Thus, for the construction of MSC the integral of Eq. (2) and the experimental density should be known; a series of runs at different temperatures or constant heating rate over a range of heating rates are needed. 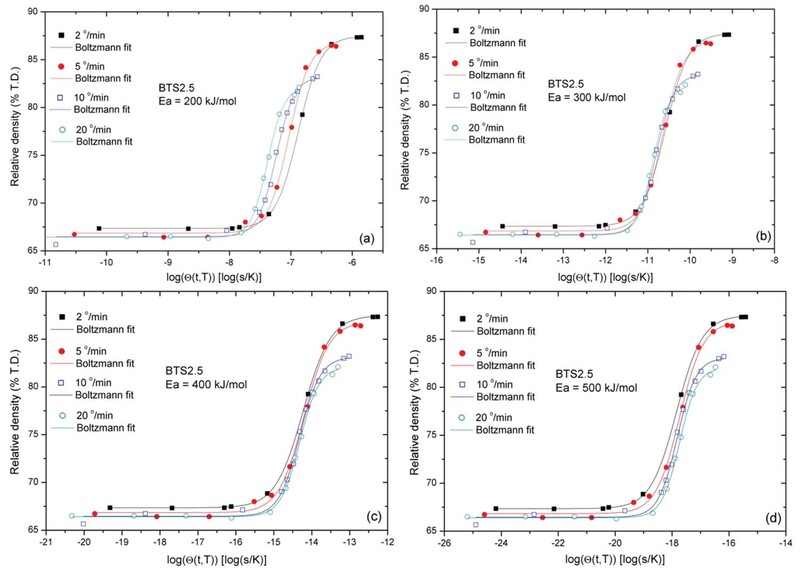 We used the concept of MSC to estimate the activation energy for the sintering for barium titanate stannate (BaTi1-xSnxO3, BTS ) graded layers in BaTi0.975Sn0.025O3/BaTi0.85Sn0.15O3 (noted as BTS2.5/BTS15) functionally graded material. 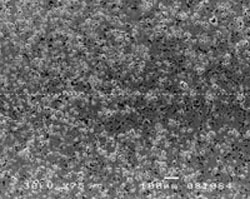 Generally, because of relatively high dielectric permittivity in a wide temperature range and lead-free relaxor behavior, BTS FGMs have practical application as electroceramics in electronic industry (i.e. ceramic capacitors, bending actuators, microwave phase shifters, sensors, etc.). 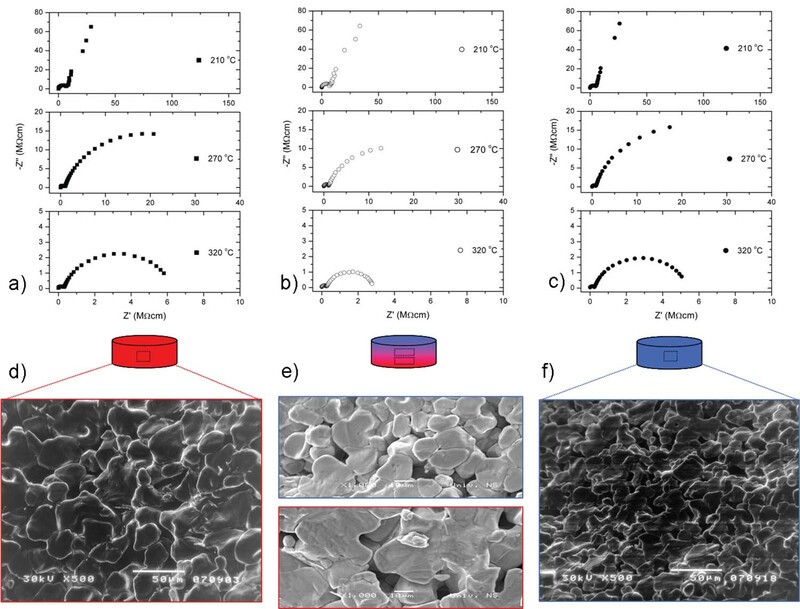 Moreover, the electrical characteristics of BTS FGMs can be tailored by modifying tin/titanium concentration gradient [2,3]. Table 1 The main characteristics of used BTS powders. Fig. 1 (a) Photograph of sintered cylindrical sample as observed in heating microscope and (b) scheme of uni-axially pressed layered sample (after sintering denoted as BTS FGM), with marked diameters measured during sintering (Image: J. Eur. Ceram. Soc. 29 (2009) 2309-2316). 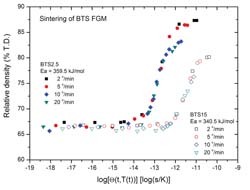 The calculated values of shrinkage were used to determine the sintering behavior of FGMs graded layers. In Fig. 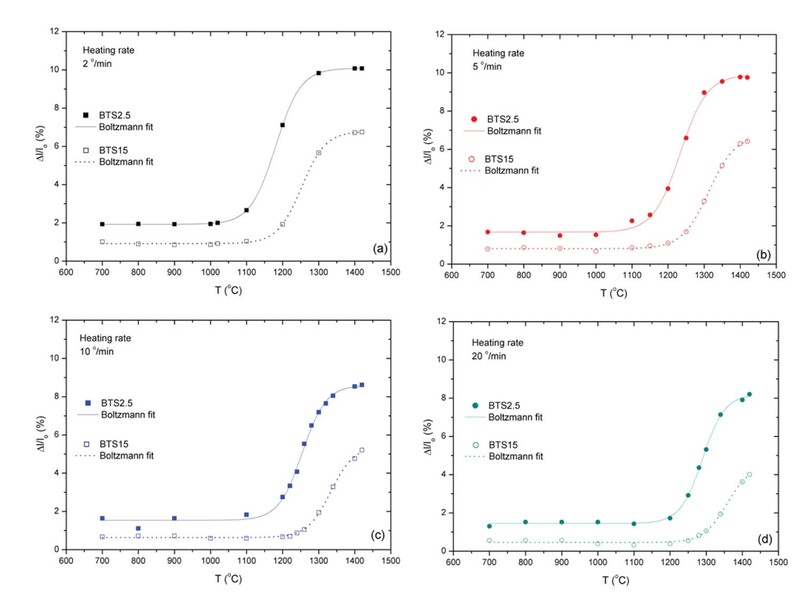 2, the sintering behavior of FGMs was represented by the shrinkage curves of the diameter of each graded layer, BTS2.5 (dbottom), and BTS15 (dtop) versus temperature during sintering. According to Fig. 2, it can be noticed that the kinetics of densification of the graded layers within the FGMs depend on the chemical composition and the heating rate. However, regardless the heating rate, there is always a difference in shrinkage between graded layers BTS2.5 and BTS15. Graded layer BTS2.5 shows a higher value of shrinkage than graded layer BTS15 in the FGMs. 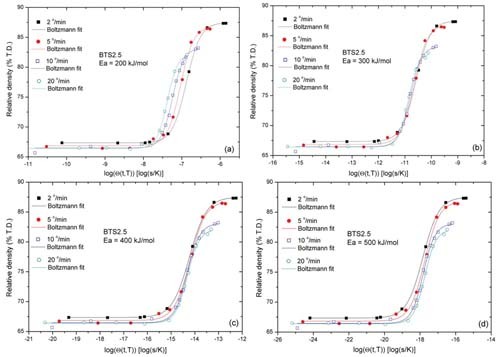 Moreover, the shrinkage of graded layer BTS2.5 occurs at the lower temperature interval. 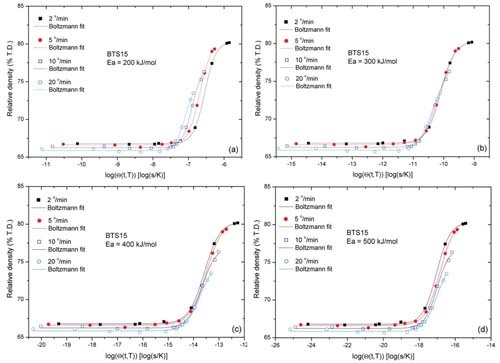 The different sintering shrinkage of the graded layers BTS2.5 and BTS15 is attributed to the difference in stoichiometry, and can be explained by different sintering activation energy. Thus, it is necessary to estimate the sintering activation energies for the two graded layers, and to find whether they are suitable for the preparation of deformation free FGMs. where r and ro are the densities of the sintered and green layer, respectively. Fig. 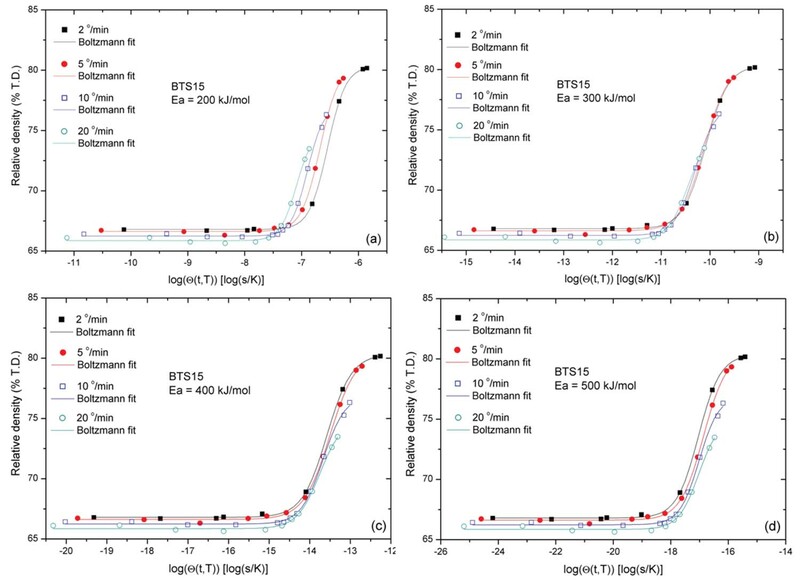 3 Relative density (% TD) versus temperature for: (a) graded layer BTS2.5 and (b) graded layer BTS15, in BTS2.5/BTS15 FGM (Image: J. Eur. Ceram. Soc. 29 (2009) 2309-2316). Fig. 4 , for different Ea, for graded layer BTS2.5 (Image: J. Eur. Ceram. Soc. 29 (2009) 2309-2316). Fig. 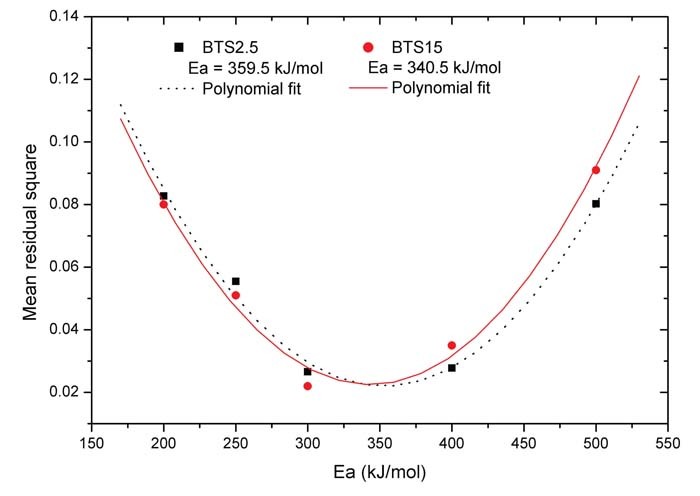 5 , for different Ea, for graded layer BTS15 (Image: J. Eur. Ceram. Soc. 29 (2009) 2309-2316). Fig. 6 presents the mean residual squares for the activation energies, used for the construction of plots , for graded layers BTS2.5 and BTS15. 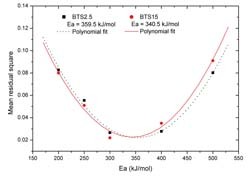 After fitting, the value of 359.5 kJ/mol was obtained as the minimum for BTS2.5 graded layer, while the value of 340.5 kJ/mol was obtained as the minimum for BTS15 graded layer. 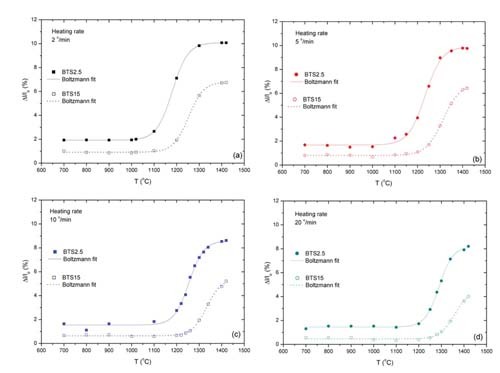 From the knowledge of the sintering activation energies, MSCs for graded layers BTS2.5 and BTS15 were constructed and are shown in Fig. 7. 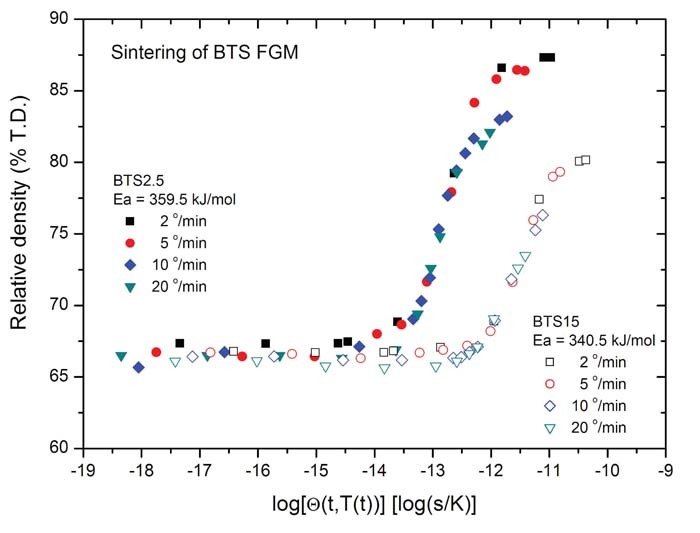 BTS2.5 and BTS15 in BTS2.5/BTS15 FGM (Image: J. Eur. Ceram. Soc. 29 (2009) 2309-2316). and BTS15 graded layers in BTS2.5/BTS15 FGM (Image: J. Eur. Ceram. Soc. 29 (2009) 2309-2316). Table 2 Electrical and microstructural characteristics of BTS FGMs . Fig. 11 Model of equivalent circuit . 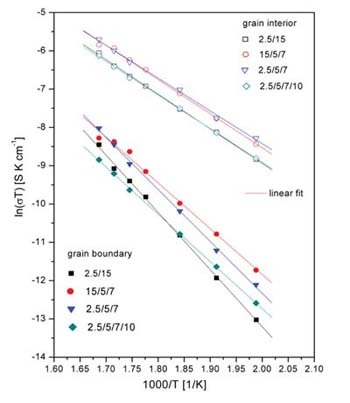 Arrhenius plots of grain-interior and grain boundary conductivity, for BTS FGMs are shown in Fig. 12. All plots obey the Arrhenius law and therefore activation energies (Egi and Egb) can be estimated from the slopes of these diagrams. The values of the activation energy determined by the least square fitting are listed in Table 2. The activation energy for grain boundary ionic conductivity is typically higher than that for the grain-interior transport, for BTS FGMs. 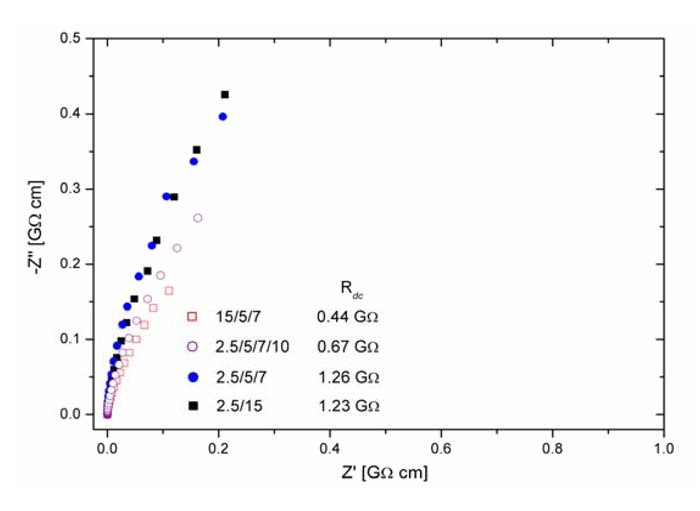 The activation energies estimated from grain-interior conductivity are very similar, ranging from 0.74 to 0.78 eV. Since Egi is determined by chemical composition, it can be concluded that the concentration gradient in FGMs does not influence the intrinsic conductivity. 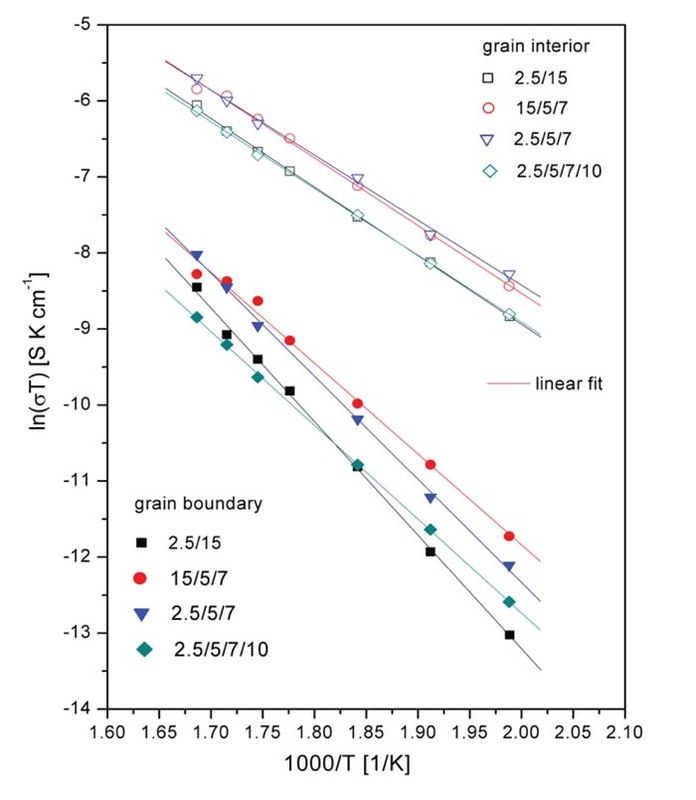 Quite the contrary, the activation energy for grain boundary conductivity is different for different FGMs; Egb vary in the range of 1.03 to 1.29 eV, influenced by the varying concentration gradient. 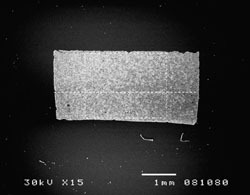 The highest Egb of 1.29 eV, exhibits FGM 2.5/15, material that possesses the highest concentration and microstructural/porosity gradient. 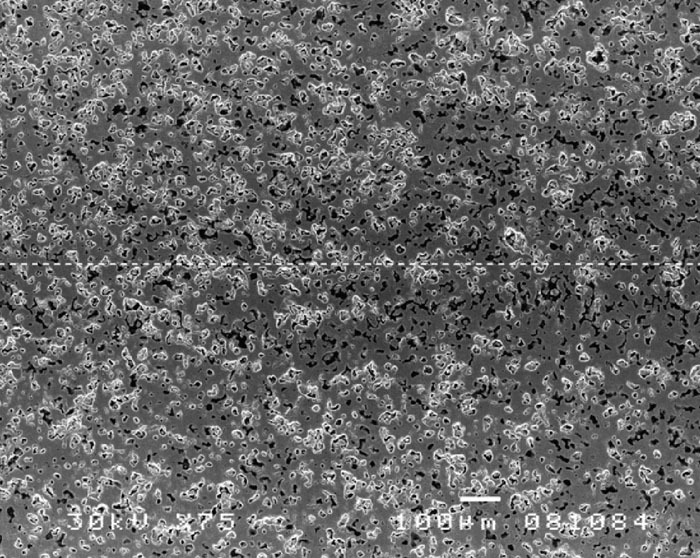 Air gaps on the contact between grains of different stoichiometry were produced due to different theoretical density of the used powder, so high porosity gradient is produced in applied sintering conditions. These air gaps act as potential barriers for the transposrt of oxygen ions. 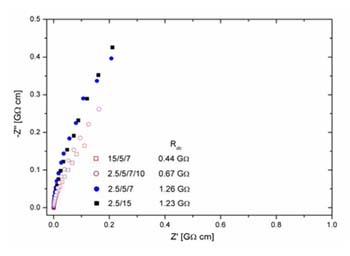 Accordingly, FGM 15/5/7 with the smallest concentration, microstructural and porosity gradient, has the smallest Egb (1.03 eV). Therefore, Egb is influenced by microstructural/porosity gradient, which are direct consequences of concentration gradient. Precisely, it is deduced that an increase of concentration gradient promotes the increase of microstructural and porosity gradients, as well as the increase of Egb.